PROMOTION ALERT : THE MERIDIAN IS ON SALE @ $2,999 ONLY. THIS $1,000 DISCOUNT PROMO RUNS UNTIL APRIL 30, 2019 ONLY. People are placing more emphasis on wellness these days. That is because they realize that a higher level of overall well-being is the ticket to a higher quality of life. This desire to live better lives has made the use of massage chairs even more important because it provides many physical and mental benefits. However, finding one that blends sophistication, comfort, and convenience so perfectly can be quite challenging. 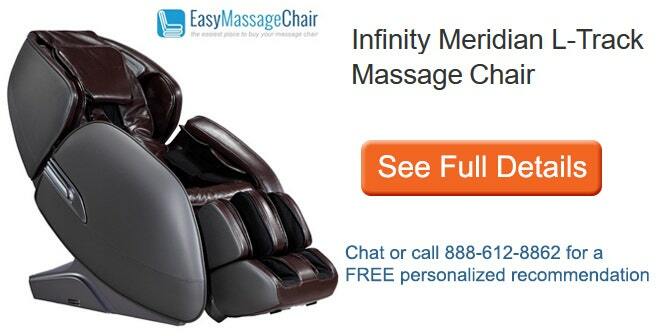 It is a good thing then that we now have the Meridian massage chair by Infinity. 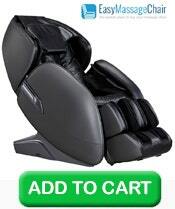 Infinity is at the forefront of innovation in the massage chair industry. They aim to provide innovative solutions to many different people in a variety of ways that will provide unlimited wellness for all lifestyles. They understand that every customer is different and that is why they refuse to settle in terms of massage chair innovations. They have engineered a wide array of massage chair models over the years that fit a variety of body types, lifestyles, and wellness goals. The Meridian is one of the models under the Infinity line of massage chairs. Space-Saving Technology - Some customers experience unavoidable space limitations. That does not mean they cannot have a massage chair though. Infinity made sure that space will be of no concern to their customers by creating space-saving models such as the Meridian. All you need to do is place the chair a few inches from the wall and its space-saving technology will move the chair forward on its track or axis. L-track Massage - An L-track massage chair not only conforms to your spine's natural shape but also extends to your glute muscles providing maximum massage coverage. The Meridian has the Infinity's signature 49" L-track system that pushes the chair's quad rollers from your head all the way to your thighs. Sole Reflexology - If you do a lot of walking or running, your feet will thank you for the Meridian's unique reflexology mechanism. Not only does it have a rotating massager for the balls of your feet, but it also has an oscillating massager for the arches and another massager for your Achilles heel. Reflexology involves applying light pressure on certain points and areas on your hands and feet. These points are connected to corresponding organs and glands in your body so stimulating them helps regulate and improve their function. Auto Programs - While there are times when we want the benefits of a customized massage, there are also days when we only have time for a quick and easy massage. You can then just choose among the chair's 6 auto programs, which include Recover, Soothe, Demo, Relax, Shoulders and Neck, and Waist and Spine. Body Scanning Technology - Some massage chairs are not as precise in terms of hitting all the unique pressure points of your body. However, the Meridian has a body scanning technology that can tailor the massage rollers to your body by properly adjusting them to hit your pressure points. Quick-Access Controls - Who needs a massage chair that's a challenge to operate? The Meridian makes it easy for you to turn the chair on and off, set it to zero gravity position, change auto programs and more with its wireless remote control located conveniently on the right armrest. Memory Functions - Everyone has their own needs and preferences when it comes to massage. You can create a custom massage program for yourself and one more person and save them using the chair's two memory function. This way, you can access them quickly next time. Air Ionizer - Massage is not the only thing that the Meridian can give you. It also makes sure you are taking in healthy oxygen via the small vents on its headrest. It even senses parts per million of air debris and displays them on the remote. Lumbar Heat - The chair warms and loosens your muscles to better prepare them for massage through the heating modules located at the back. Bluetooth Speakers - Enjoy your massage even more by playing some relaxing tunes, ambient soundscapes or even guided meditations. You can pair your Bluetooth enabled Apple or Android device to the chair and it will play the music through its own speakers. USB Charging Station - Do your mobile devices need charging? No need to get up from the chair because it has its own USB charging station conveniently located on the left side beneath the waist airbag. You can charge the chair's remote there as well.